Yesterday, we planned to head on over to the playground at the school since The Girl has been asking to have the training wheels removed from her bike. Since the school has a fairly even blacktop, it seemed a good place to let her practice her 2-wheeling. We were both pleased and surprised when after just a few minutes of wobbling about, The Girl was going 'round and 'round the blacktop without her training wheels on. While we were there, The Boy and I started playing "Around The World" until another boy from his school showed up and the two of them finished the game together. We were only at the school for about an hour, but it sure was nice to be able to get the kids outside for some fresh air for a change. We didn't plan on having a big birthday party for my Elder Boy's 18th birthday. In fact, he requested we not do a birthday party at all. I guess he's not into large crowds. However, he DID request a Caramel Pecan Silk Supreme pie from Village Inn instead of his annual birthday cake creation. While I was a bit disappointed that I couldn't make his 18th birthday cake, I am a big fan of the caramel pecan silk supreme pie (YUM!) so my disappointment faded very quickly. In the span of 3 weeks, getting the pie for his birthday morphed into a full blown dinner at Village Inn with the whole family as well as his girlfriend's family - 9 people total. 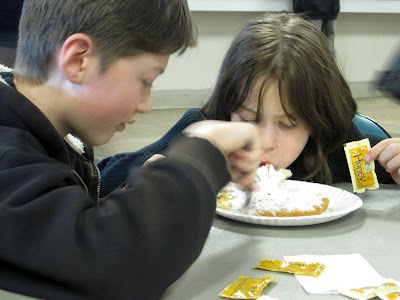 But considering that's about the extent of who we know and socialize with outside of Mr. LH's work, that was about as big as the party would get anyway (unless of course my son decided to invite his high school pals). Mama J (girlfriend's mom) decorated Elder Boy's chair before we got there to create his "Throne of Honor". Of course, he pretended to be embarrassed about it. It's one of those burgers you have to smash down to be able to hold it...and then open wide to be able to eat it. He managed just fine. As I said, it's his "usual" so he's had plenty of practice. 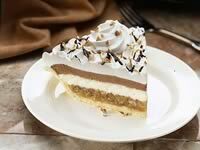 After dinner, the wait staff brought out his full pie - complete with candle. Then the manager came on the intercom, announced his birthday and asked everyone in the restaurant to sing to Elder Boy (arranged by Mama J specifically to embarrass him). It was a nice dinner. If we can catch up with him Thursday, we might celebrate his birthday again when he's officially 18. Though I hear there is a surprise in store for him at school so he might be hiding out somewhere afterwards. 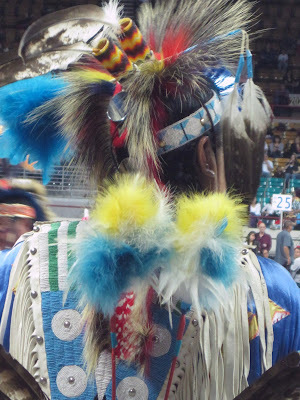 I had known about the Denver March Pow Wow for a couple of months. A friend of mine suggested it back in January and I thought the kids would love it (and even if they didn't, *I* would love it). Thankfully, when the event weekend was upon us, that same friend reminded me of it. I had forgotten the Denver March Pow Wow was in March (imagine that) and that March was actually here. Well, we had said back in November that we would start venturing out again when the weather warmed up a bit. At 72 degrees in what is historically one of the snowiest months of the year here, I'd say the weather warmed up enough for a day trip into the city. The first new thing today was just going to the Denver Coliseum. None of us had ever been there and it would be a destination for any future concerts or events we chose to go to. It doesn't sound very exciting, but we're still driving around town with the help of a GPS so any place new that we learn to navigate to is wonderful! 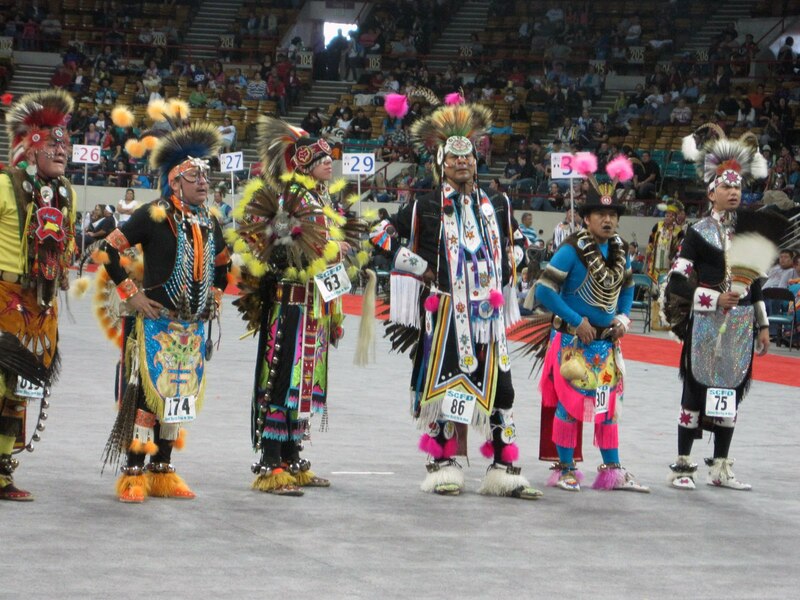 The second new thing of the day was the Denver March Pow Wow itself. 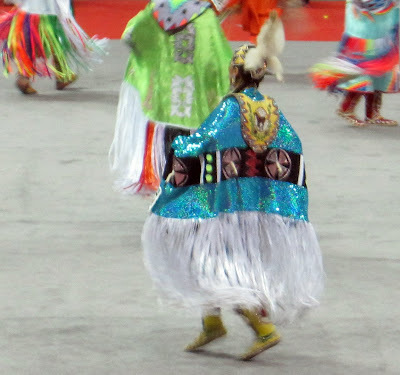 I hadn't been to a pow wow in about 15 years - maybe more. I love hearing the drums, the singing, the dancers' costumes and the crafts for sale. Having such a large pow wow here in town is a treat, and though The Boy might have probably preferred sitting at home this weekend surrounded by his Legos, I think one day in his future he'll appreciate having experienced another culture. It took a while to win him over to the Celtic Festival and Highland Games in NC. The Denver Pow Wow will probably become an annual event for us just like (I hope) the annual Renaissance Festival coming up in June/July. The Boy brought home a notice about the upcoming mandatory Science Fair for all 3rd, 4th and 5th graders. No problem! We expected a science fair project would be required. What we didn't expect was the very short time in which to do it. We had just over a month to complete the project and have it ready for judging. Ugh! That eliminated growing anything. This is March. Snow is still a possibility. And the few sunny windows available indoors currently have house plants crammed in front of them. The Boy and I decided to do a project measuring the effectiveness of UV light blocking materials such as sunscreens, sunglasses, clothing, etc. We read about UV beads that are UV light sensitive and succeeded in finding some online at Steve Spangler Science. They actually look like craft pony beads that The Girl can use after our experimenting is done. 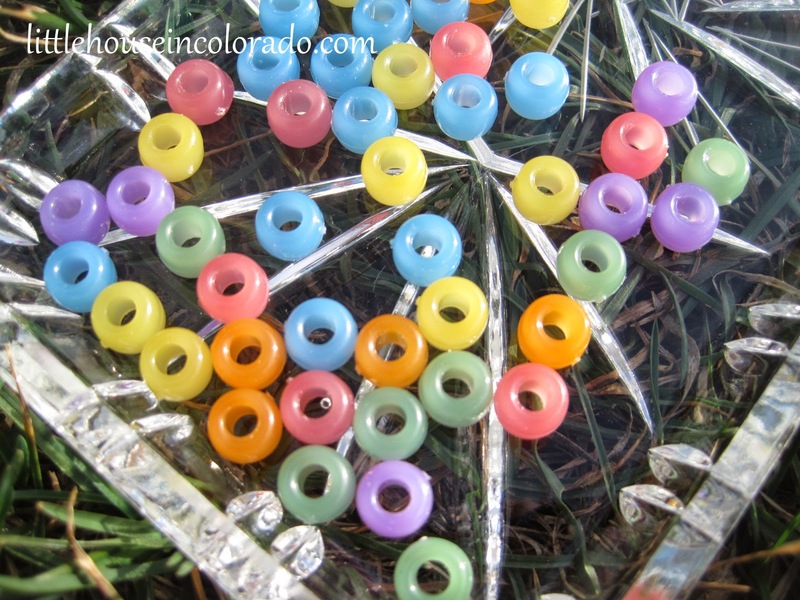 The white beads, when exposed to UV light (taken outside) transform into a rainbow of colors. The more UV light, the more intense the bead color. Coincidentally, the company we purchased the beads from is located in Colorado not far from where we live so our beads arrived in record time (even faster than my fastest Amazon orders). In the package, they included a free gift of Jelly Marbles. 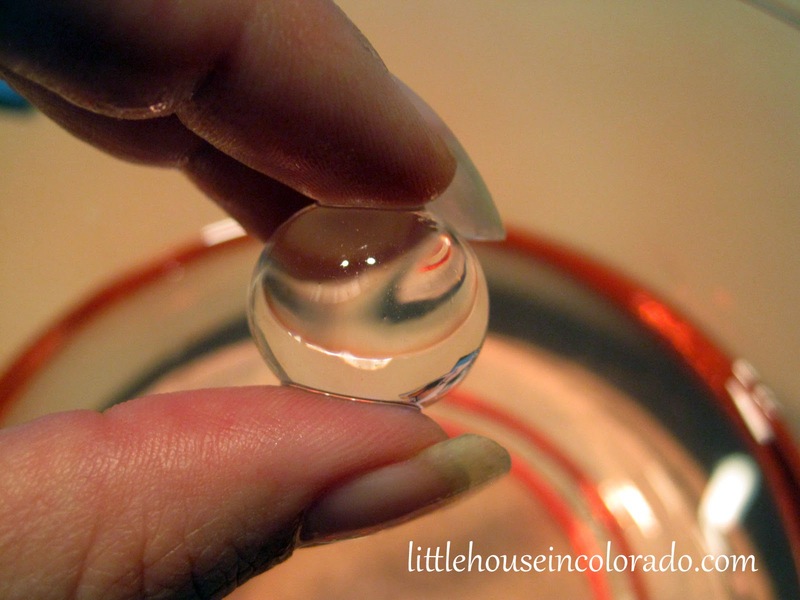 They just looked like BB sized balls, but they were actually made of a super absorbent polymer. When added to water, within 12 hours they were the size of glass marbles. 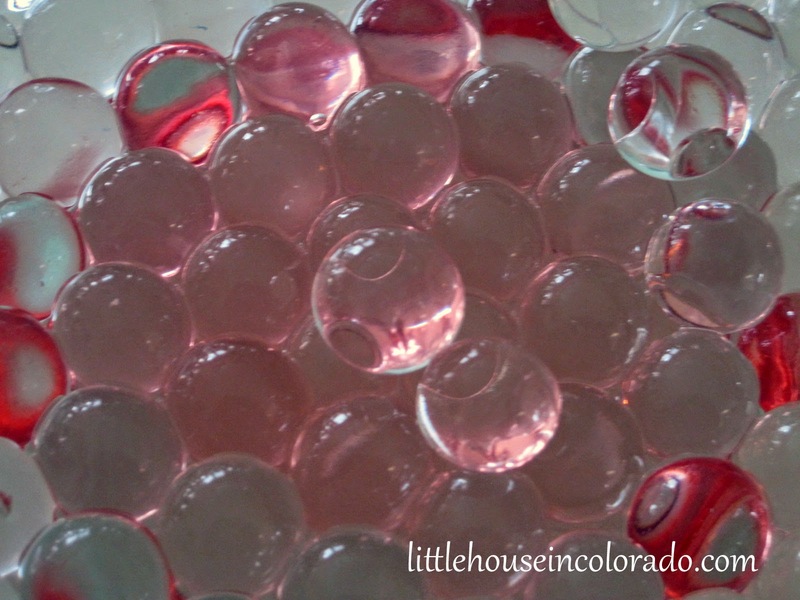 We had a bowl full of semi-squishy, clear spheres that became the main attraction in our kitchen over the course of the next few days. I half-expected the marbles to be sticky or slimy, but they weren't. They were just...wet. When water was added to the bowl of Jelly Marbles, the marbles virtually disappeared. 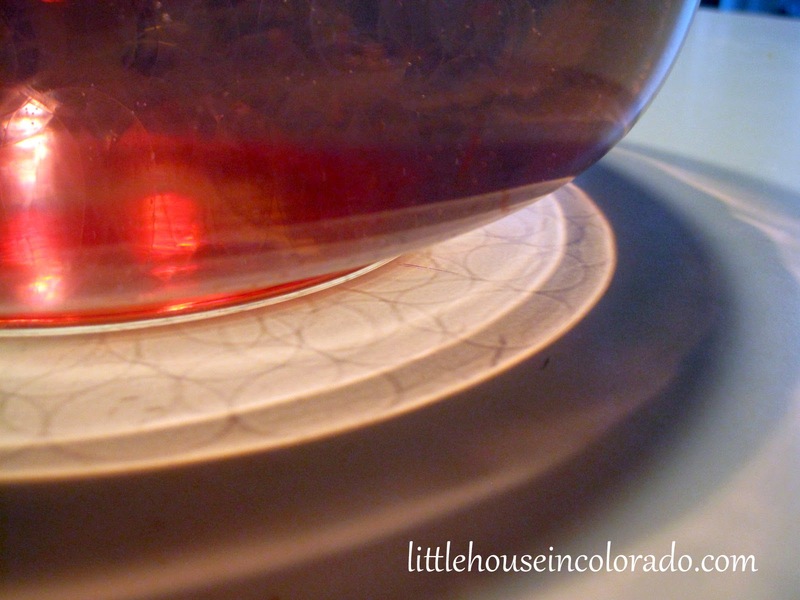 In fact, The Boy thought they dissolved in the bowl until he saw the reflection of the water on the counter. 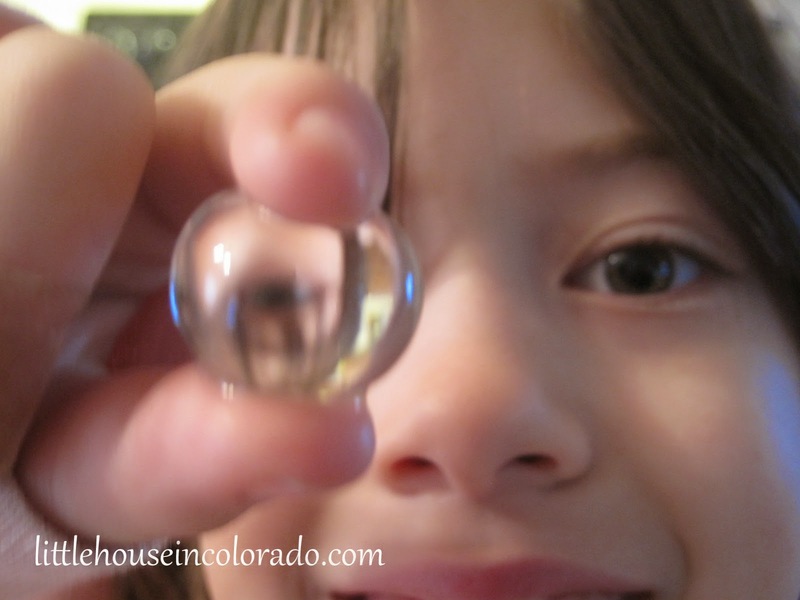 We found out later that the marbles "disappear" even more after they absorb additional water. Elder Boy picked up the large glass bowl of marbles (without the extra water) and looked down into the bowl, through the jelly marbles at the base at the floor. He said it looked like a kaleidescope with all the colors of the rug reflecting off all those clear marbles. The "Pickles" found humor in seeing each other upside-down through the marbles. And everyone enjoyed just walking by the bowl everyday and sticking their hands in it. When the marbles dry out, they go back to their original BB size state so you can store them for the next time. I'm thinking about getting several pounds of the similar Jelly Crystals to use in my gardening since this area is so dry. Watering is limited and these crystals may very well be the answer to keeping my outdoor plants alive. I went back to Steve Spangler Science to order a UV black light for additional experimenting with The Boy's science fair project. It turns out we're also getting another free bag of Jelly Marbles in the shipment. Looks like were going to have some water absorbing fun this summer! This prize looked pretty bedraggled when I got it - like it had been dragged across the floor and stomped on. But there were no tears, holes or stains so I took it home. A trip through the washing machine had this pretty pink velour blanket looking brand new! My daughter loves it!